There has been some changes to this park, many areas are now restricted to horses due to a new wood cable fence and gates; it is also overgrown. Please visit the park first without your horse to determine if this is a place you want to ride or not. I have received messages from two different riders that due to the gates and overgrowth the riding here is very restricted and it is hardly worth coming out for. Unless you live extremely close and can ride over you may not want to mess with hauling your horses here. There is no longer a good area to park your truck and trailer anymore. Thank you WTTA users for updating us on the condition of this park. From FM 78 in Cibolo, turn south onto S. Main, turn right onto W. Schaefer, cross over Cibolo Creek, and then you will see the entrance to the park on your right. The Park Hours are from dawn to dusk. 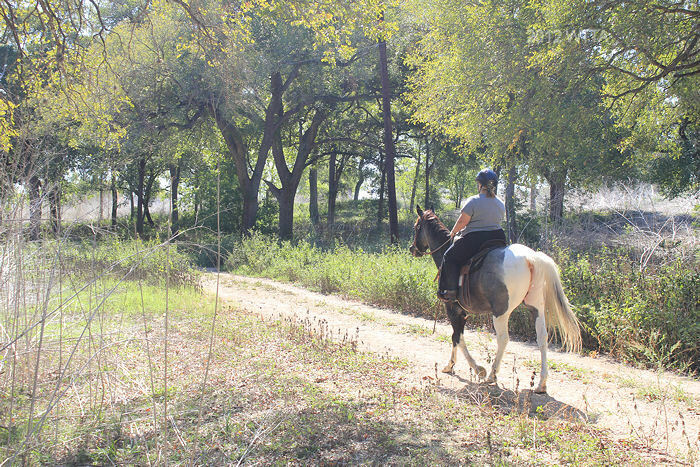 In order to ride at Crescent Bend Nature Park you must purchase a permit ahead of time from Schertz Animal Services and you will also have to provide proof of your horse’s negative Coggins. Overnight camping is not permitted at this time. Dogs are allowed and this is a park in which people often walk their dogs. Dogs must be on a lease at all times and owners are to remove/scoop up their puppy’s waste. This park has no real facilities for horses. 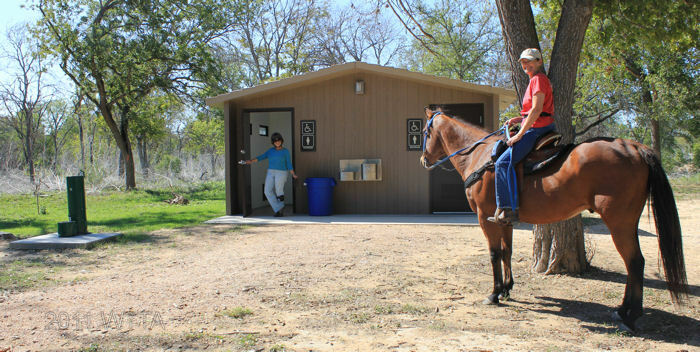 There is no trailer parking area, no hitching posts, no pens, etc… The park does have one restroom facility with a women and men’s bathroom. Next to the restrooms is a water fountain and one water faucet which a hose can be connected to. When purchasing your permit from Schertz Animal Services be sure to inquire where you can park your truck and trailer, as there are only parking spaces for cars at this park. I was able to park near a picnic table off of the road. Exact mileage is unknown as there are no actual trails. I rode next to the old roads and made some of my own trails. 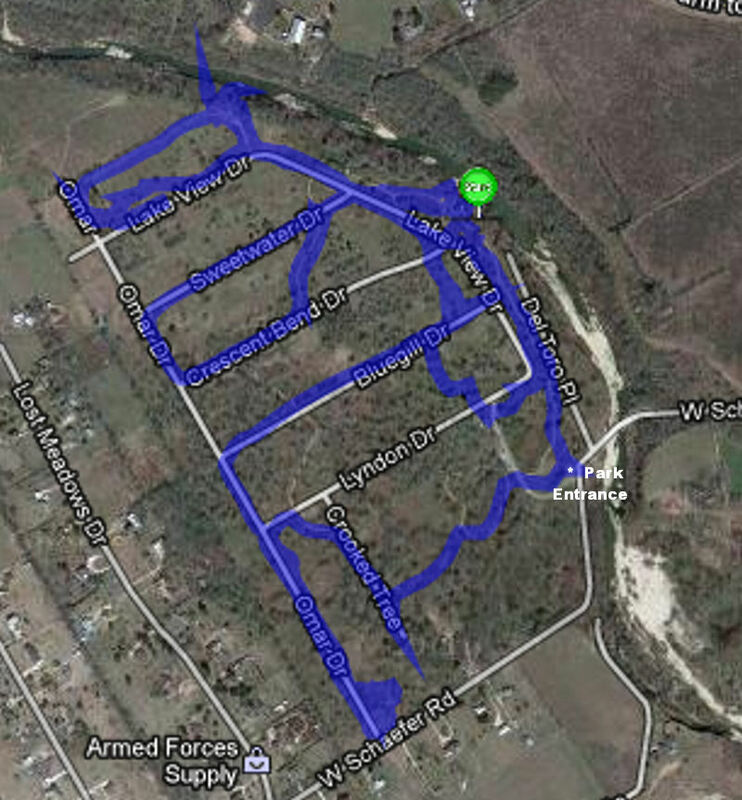 According to my iPhone GPS MotionX app, we rode 5.5 miles. The blue lines mark where we rode. The terrain is very flat, grassy, and there is lots of brush in some spots. Some areas are a little gravely but for the most part there are few rocks in this park. This is an old subdivision with several asphalt roads in a grid like pattern. This park would be great for driving your horse. 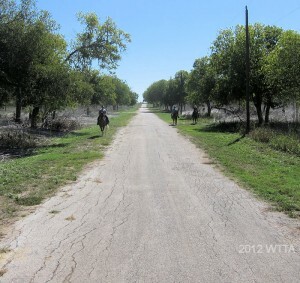 There is a granite pathway for pedestrians which horses are to stay off of, however, you can ride beside these pathways. Carol and Ace, crossing the road. The asphalt road is intersecting with the granite pedestrian walkway. Contrails above from the Randolph AFB Air Show. Crescent Bend Nature Park (CBNP) was opened to the public on 9/18/2009. In the 1970s this area was originally known as Lakewood Acres, a subdivision with some small businesses. 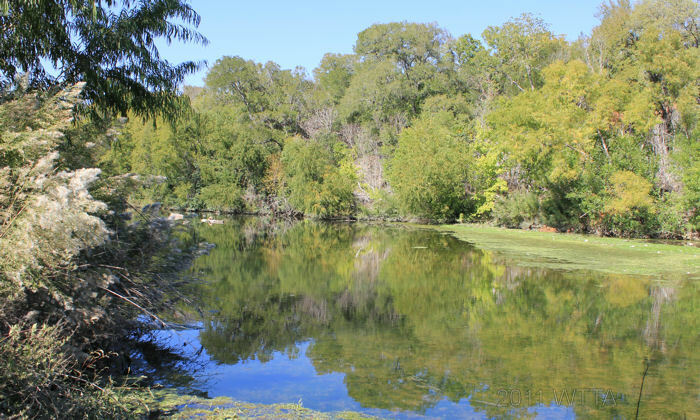 CBNP is a 190 acre tract of land located in the flood plain of Cibolo creek. Home and property owners on this land suffered from several floods, the worst of the floods occurring in 1998, devastating the area. 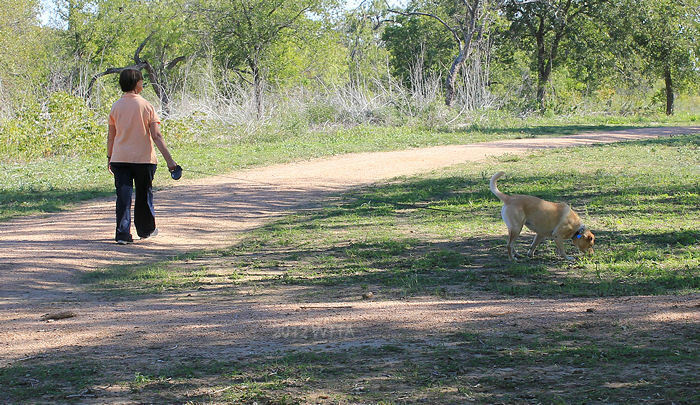 Crescent Bend Nature Park is currently owned by Bexar County with future plans of transferring ownership to the City of Schertz and is managed by the Schertz’s Park Department. Goals for this Nature Park include returning the land to its original form providing opportunities for the public to observe native species of plants and animals. 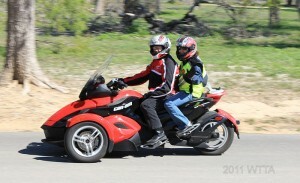 Crescent Bend is a well known park for birding. Photographer C.A. Mallard, has completed two books, The Nature Within: Crescent Bend Nature Park and Crescent Bend Nature Park: Birds and their Habitat, detailing photos and information on the wide variety of bird species. 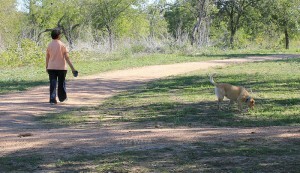 This park is also popular with dogs owners, bicyclist, hikers, and picnickers. 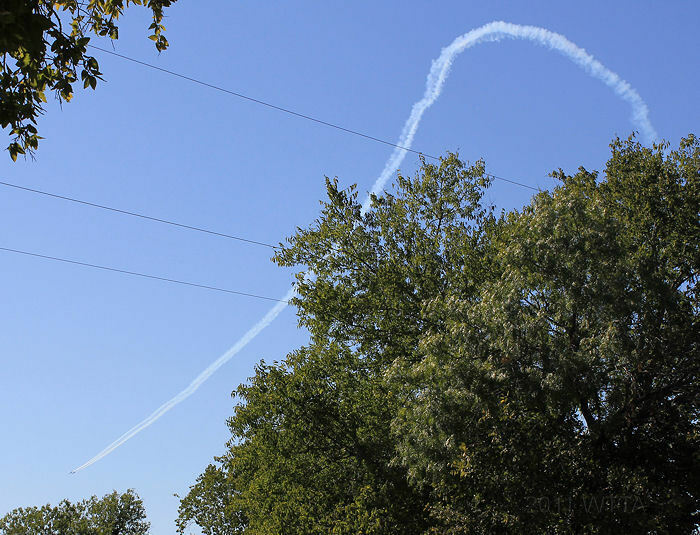 During my first ride at the park, Randolph Air Force Base was putting on an air show. We were fortunate to hear and see the U.S. Navy’s Blue Angels roaring by at about four to five hundred miles an hour. The roads at Crescent Bend would be great for driving your horse. hundred miles an hour as we explored the park! This would be a great park to start a carriage horse. The asphalt roads are still in good shape and there is very little traffic on the old subdivision roads. The few vehicles seen on the roads were cruising at a slow speed, providing a great opportunity to slowly acclimate a carriage horse to the road in a fairly low stress environment. Towards the back corner of the park on the Northwest side between Omar, Lake View Drive, and Cibolo Creek is a dirt road, open field, and some deadfall. 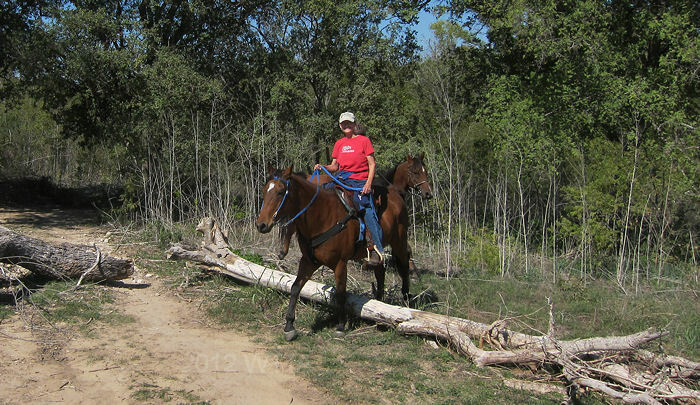 This is a nice little area to ride and work on crossing logs with your horse. A trail in this area by the deadfall leads back to the creek, however, I found no way to get to the creek, as the narrow one-track trail has a sharp drop off and is a bit dangerous. Since I could not get to the creek I had to turn Angel around very carefully to get out. 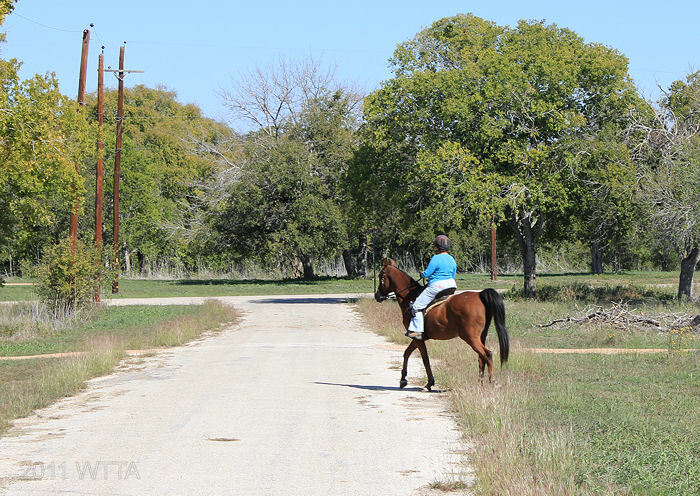 Access to Cibolo Creek from the park is a little tricky, as there are several trails leading to the creek but they have extremely steep drop offs and are not safe for horseback riders. I only found one trail closer to the front of the park which safely leads to the creek. This is an interesting park to ride in, as it is like riding in a neighborhood complete with streets, street signs, and telephone poles, but lacking homes. I found myself imagining how the previous neighborhood might have appeared and I wondered about the past home owners overcoming the struggles of a devastating flood. 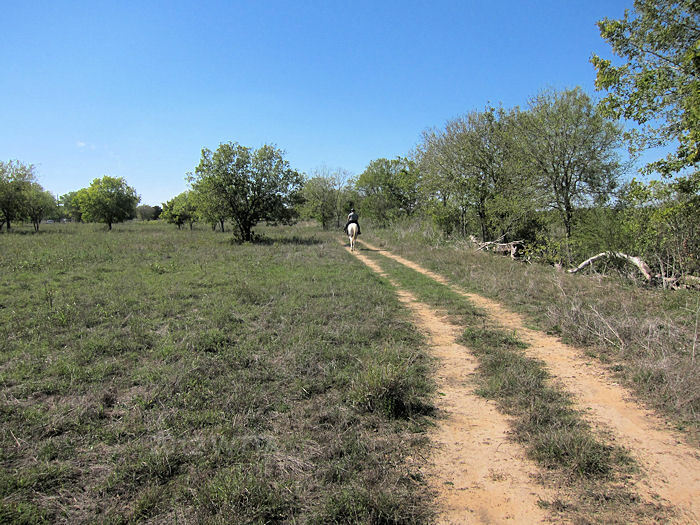 This park does not offer much for long distance trail riders, however, it is a nice place for a short ride away from home, especially if you are near the area. I am excited there is a park less than ten miles away from my home, making it easy to haul my horse to. It is always nice to change up your horse’s environment and go “off campus” as I like to say. 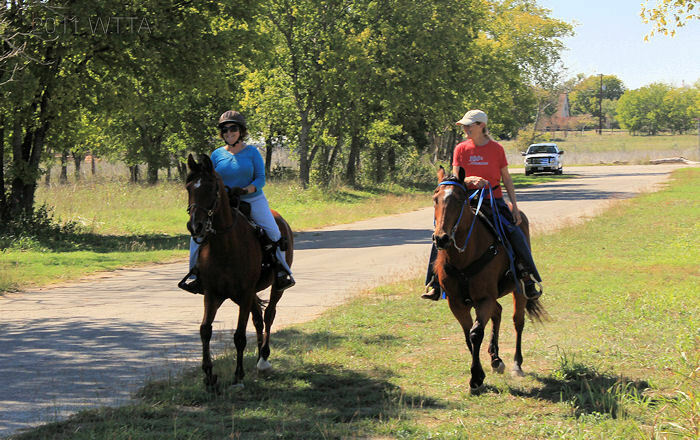 Riding away from home provides many opportunities for training and desensitizing your horse. Caroline and Jack heading down Crooked Tree Road. Backroad in the Northwest side of the park. Shirley and Epic doing obstacle practice over deadfall towards the back of the park.